Modernization | Complete Elevator Service, Inc.
From the most basic upgrades to elaborate renovations, Complete Elevator Service has everything to offer when modernizing your old hydraulic or traction elevator. 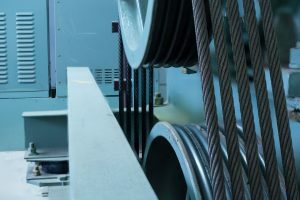 These modernizations can significantly improve your old, outdated elevator and provide a safer, faster, more enjoyable ride. CES provides elevator modernization service to update existing equipment to comply with city codes, fire service requirements and handicap accessibility accommodations. We also provide elevator upgrades for equipment damage, controller replacement as well as outdated equipment. Your elevator is a major investment and we know that installing a new one can be stressful and also expensive. This is why CES assures affordable effective service to solve your current elevator problems; resulting in a happy, satisfied you. All electric power for lights, tools, hoists, etc. during erection as well as electric current for starting, testing and adjusting the elevator. A heavy duty fused disconnect switch for each elevator per the National Electrical Code with feeder or branch wiring to controller. Size to suit elevator contractor. A 120 volt, AC, 20 amp, single phase power supply with fused disconnect switch for each elevator, with feeder wiring to each controller for car lights. Suitable light (min. two 4’ florescent lights) and convenience ground fault outlets in machine room with light switches located within 18 inches of lock jamb side of machine room door. A convenience outlet and light fixture in the pit with the switch located adjacent to the access door. Live detected phone line in elevator machine room. Self-closing/ Self-locking machine room (always locked from outside).